Researchers from our group published a paper last month using non-pathogenic bacteria Lactococcus lactis, previously engineered in our lab to express human fibronectin, to culture human mesenchymal stromal cells. Dr Aleixandre Rodrigo-Navarro has prepared this post explaining their work. In this paper, we show how a lactic bacteria, Lactococus lactis, is engineered to express a fragment of the human fibronectin, an important extracellular matrix (ECM) protein. This fragment encompasses its 7th to 10th type III (FN III7-10) domains that include the RGD integrin adhesion motif and the PHSRN synergy site. RGD is important because is where cells, through integrins, recognize their surroundings and interact with them. The synergy site reinforces this interaction. 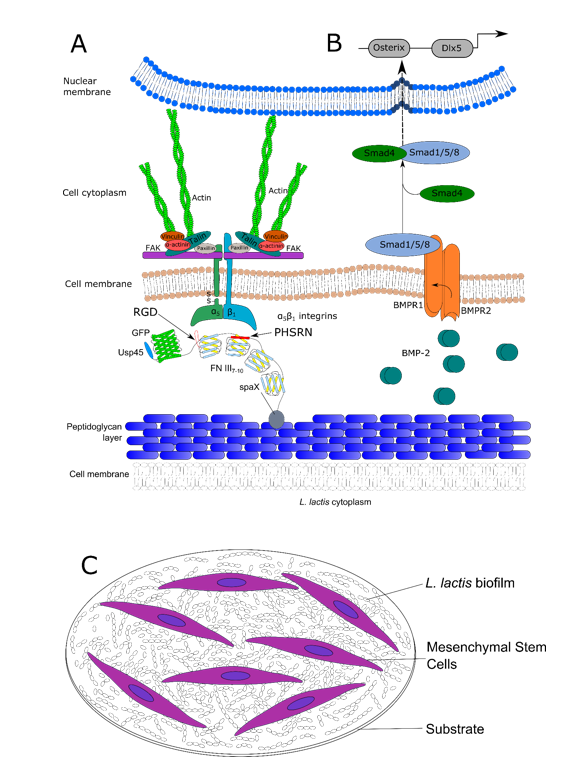 A previous paper from our group showed how L. lactis expressing this fibronectin in its cell wall enables cell interaction with mammalian cells and biofilms produced by this strain. This work goes one step further, by investigating if we can direct stem cell fate towards a predefined lineage. 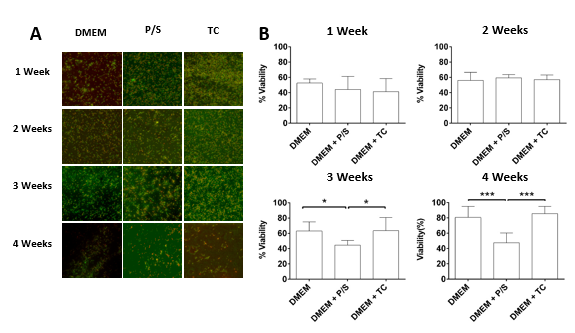 We chose differentiation to osteoblasts using bone morphogenetic protein 2 (BMP-2), a cytokine with strong differentiation effects on mesenchymal stem cells. To do so, we use our established approach based on biofilms produced by this strain that enables mammalian cells to adhere to the cell-wall expressed fibronectin, and then we supplement the growth medium with BMP-2 to assess if the adhered mammalian cells are able to differentiate to the osteogenic lineage (figure 1). As expected, the human mesenchymal stem cells (hMSCs) adhere to the biofilm and develop a stable cell monolayer on top of the biofilm. After 24h, when the hMSCs are adhered, the medium is changed and BMP-2 is supplemented to the medium. The cultures are maintained for 28 days in standard cell culture conditions and then, assessed for osteoblastic differentiation markers. There are several ways to determine if hMSCs differentiate to other lineages. We used immunostaining against osteocalcin, a protein present in mature osteoblasts but not in undifferentiated hMSCs. 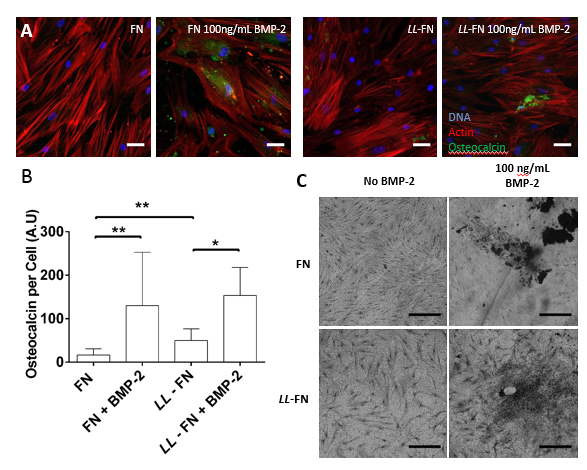 Cells established on the biofilm and supplemented with BMP-2 showed positive osteocalcin staining indicating successful differentiation to osteoblasts. This result was further confirmed by Von Kossa staining, an assay that shows the presence of phosphate deposits, that are developed within the early stages of bone tissue development (figure 2). Moreover, direct interaction between mammalian cells and the underlying bacterial biofilm was assessed by using scanning electron microscopy (SEM). The images showed the direct interaction between the bacterial membrane where fibronectin is expressed and the mammalian cells co-cultured with them (figure 3). The viability of both mammalian cells and the underlying bacterial biofilm was assessed showing that the bacterial biofilm is stable during the whole four-week assay. Since this strain produces lactic acid as a result of its metabolism, tetracycline, a bacteriostatic antibiotic, was used to keep the biofilm in a dormant state avoiding further medium acidification (figure 4). ← Protein mobility on the surface of polymers. 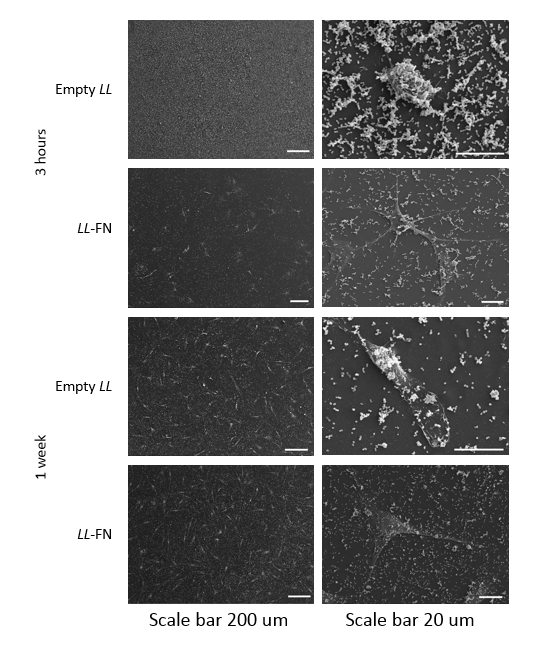 Influence of lateral chain length of acrylates on fibronectin conformation and cell response.